This bear couple has a cub on its momma's back and all three are wrapped with turquoise and coral nuggets. It measures approximately 3 1/4" wide, 2 1/4" tall and 1 3/8" thick. 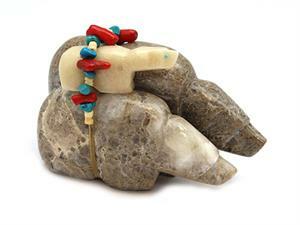 It is Zuni hand carved by Ed Lementino. Only this one available.